One of the Goddesses that reflects the flux of seasonal cycles, and belongs truly to Winter, is the Nordic Frau Holle. Holle has very ancient origins indeed, and may have been a prehistoric, a pre-Christian Weaver Goddess, a Spinner of fate. Mother Holle is very much associated with Yule, and with the warmth of hearth and home, especially in the winter. Also known as Holda or Hulda, she is a manifestation of the Pagan triple goddess, embodying the passages of life through birth to death, in both light and dark. In some early myths, she is "the ash girl", her face half black with soot and half white. This remarkable metaphor comes from a story of how, in order to marry the God of Winter she had to come to him neither naked nor clothed, and neither in light or darkness (thus, both the "White Goddess" and the "Dark Goddess"). Like the myth of Persephone, who becomes the Queen of both death and spring, Holle (perhaps, fittingly, related to words like "Holy", "wholly", and "whole"?) in old age is Winter's Queen, and encompasses the Circle of dualities. 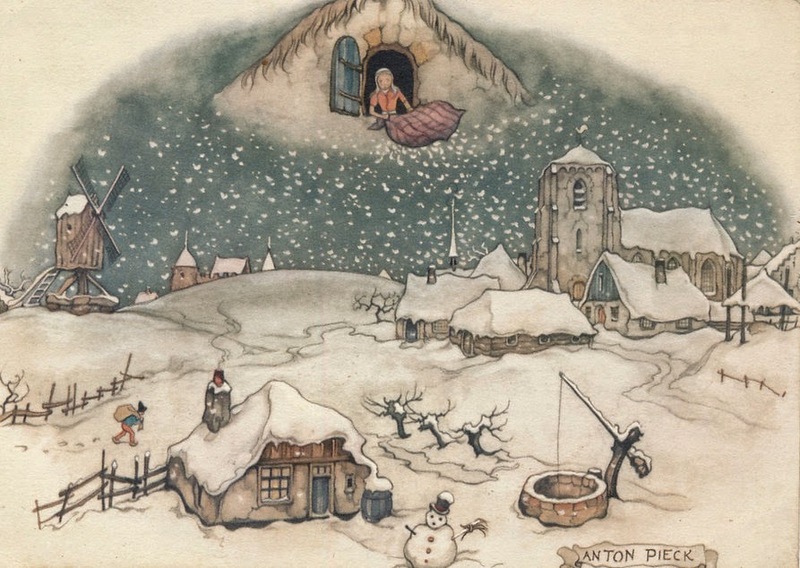 As old Mother Holle/Holda, it was believed that she brought soft snow to put the world to bed. Mother Holda is the source of the "Mother Goose" legends, because the snow flies when she shakes the feathers from her down feather bed. In Holland, they still say that 'Dame Holle is shaking her bed'. For anyone who may wonder where the "flying broomsticks" of witches (or Harry Potter) comes from, Dame Holda is probably the original source. Because of her association with the hearth and home, the Broom was both a symbol as well as a magical tool. Folk traditions of "sweeping away evil from the hearth" are found throughout Europe. As a symbol of the Hearth ("the Heart of the household") it is interesting to see this also transformed into the "vehicle of witches" as Pagan mythology, and folk rituals, became transformed and often diabolized in later Christian times. 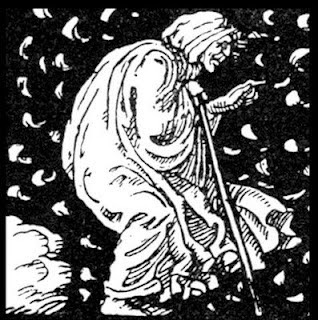 In later folktales, Frau Holle becomes a fearsome hag, riding her broom and bringing the storms of winter. Holda/Holle/Hel is both light and dark, young and old, illumination and shadow, living in the "nether world" and the material world. Holle demonstrates the non-duality of nature. Spring becoming Summer becoming Winter becoming born again. Whole. I think this reflects my sense of how very important holistic consciousness is, personally and collectively, whether we speak of "shadow work", the coming to terms with the ebbs and flows of self, or the cycles of our Mother Earth, the ebbs and flows of the seasons and the creation/death/rebirth cycle. Whether microcosm or macrocosm, to try to live within the perspective of the Whole. So who is Hel, the ashy side of Holle's face, from whose name we get "Hell"? Besides being the origin of the word people use daily as a swear word, and millions of Christians have a mighty fear of going to if they don't get baptized or redeemed (and blissfully ignorant of where the concept originated from). Hell has been used, very effectively, by the early church as a scare tactic to frighten the masses into “righteous” acts. People no longer remember that once "go to Hell" meant, simply, to die and go to the underground realm of the Dark Goddess. To get the real story, we have to go back to the early Nordic peoples with their Triple Mother, and look this death Goddess in the face. 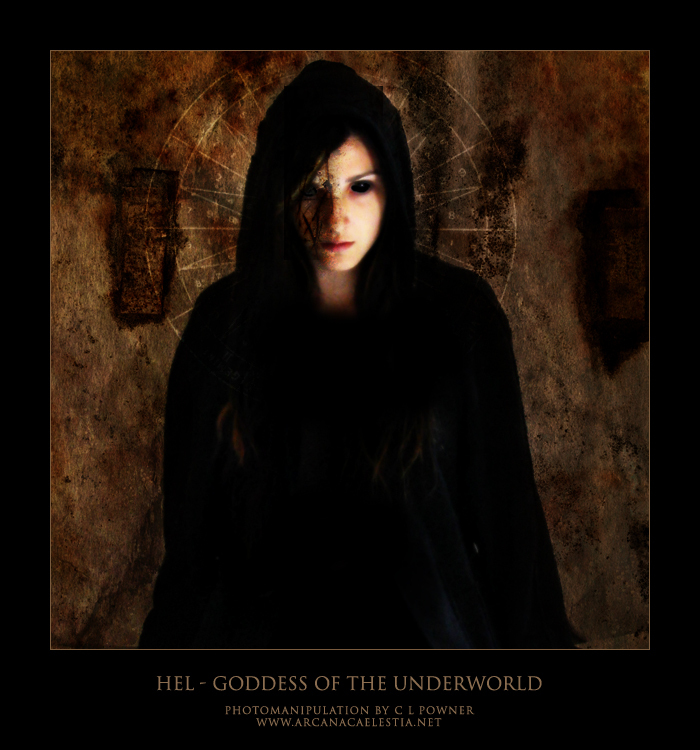 Hel has a realm in the netherworld or the underworld (and the idea of underworld, or womb/tomb Goddesses is very ancient indeed, going back to the Paleolithic, and may be part of the apparent sanctity of caves and their amazing cave paintings.). She is the ruler of that underworld country to which souls who have not died in battle will depart. As thanks for making Her ruler of the netherworld, Hel makes a gift to Odin. She gives him two ravens, Huginn and Muninn (Thought and Memory). In Nordic mythology Ravens are messengers between this realm and the next, psychopomps that can open pathways. The name of Her realm is Helheim, and perhaps like Maat of Egypt, Hel is the judge of each soul that enters her realm. Those who were cruel and evil in life must endure a place of icy cold for a while as punishment (a fate that the people of ancient Scandinavia and Germany apparently found much worse than a nice warm lake of fire). Unlike the Christian concept of Hell as a place of eternal damnation and punishment, however, Helheim also served as the shelter (womb of regeneration) for souls waiting to be reincarnated. "Hel watches over those who died peacefully of old age or illness. She cares for children and women who die in childbirth. She guides those souls who do not choose the path of war through the circle of death to rebirth." Like Persephone, who is both the Spring Maiden and the Queen of Hades, Hel as the dark side of Holle governs the underworld or invisible realm. In magic, like Hecate, she is a pathfinder where the veil between worlds is thin. 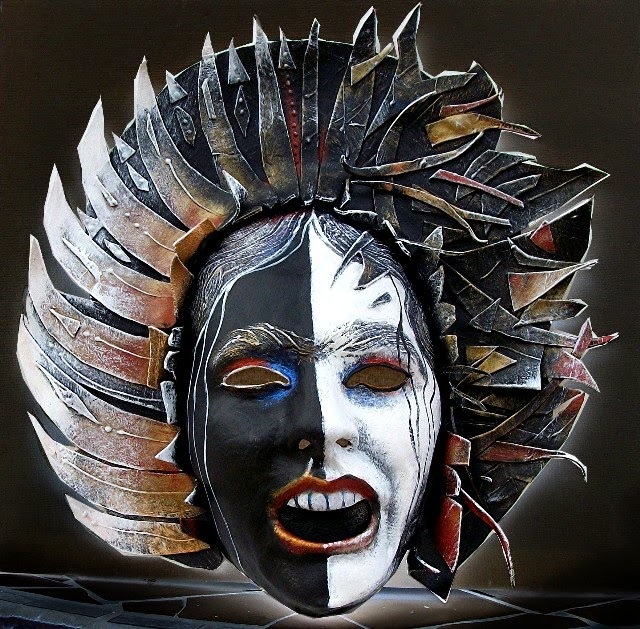 Seidhr [SAY-theer] or Nordic shamans called upon Hel's protection, and in doing so they wore "the helkappe", a magic mask, to render them invisible and enable them to pass through the gateway into the realm of death and spirit. The Helkappe was a mask, thus understood as a transformative, liminal tool that enabled one to transit between the seeming dualities of life..........and like masks and sacred drums throughout the world's traditions, it was infused with shamanic power. 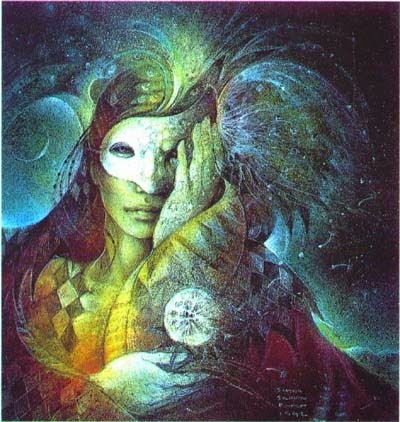 To take the wisdom of this metaphor further, to thus wear a mask as a psychic tool was to engage consciously with the continual flux of personae - young/old, dark/light, good/bad, male/female. This is the realm of the soul, beyond duality, beyond time. 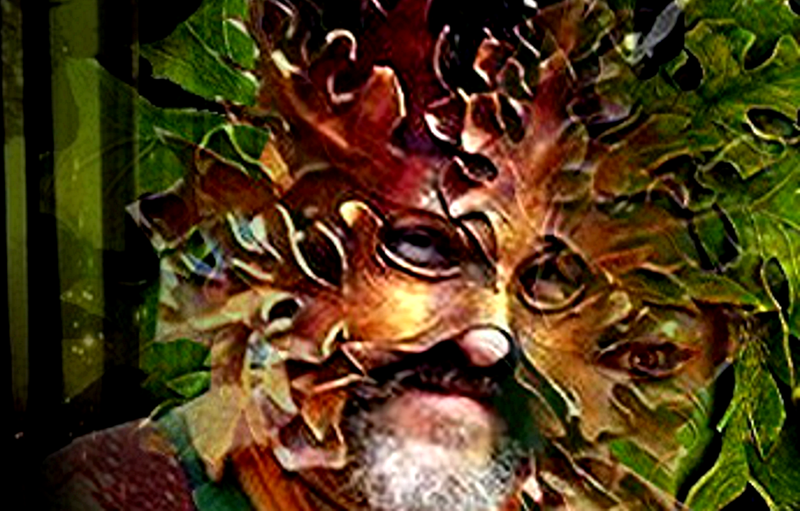 Wearing the "Helkappe", in whatever way one may imagine such a mask........enables one to enter both realms. 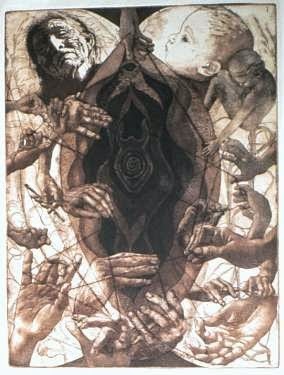 A wonderful commentary on Holle/Hel come from the Goddess Inspired Blog by Silvestra, who has helped me to understand the non-duality of this myth, and it's unfathomably ancient origins. Rather than me try to paraphrase her, I take the liberty of copying the article here, and provide the link to her Blog below. "Mother Holle started off Her existence as the Goddess of Death and Regeneration. 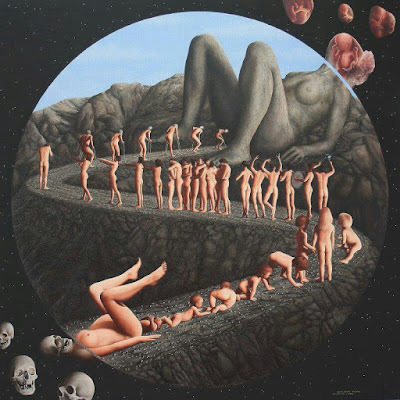 During the Neolithic in what Marija Gimbutas termed Old Europe people believed in the cyclical nature of all existence. Every ending was understood to be the beginning of a new chapter. Death, rather than being the final end, was seen as a resting stage prior to new life. Just as seeds rest deep undergound during the cold winter months waiting to sprit up as a seedling in spring, so were the dead seen as having returned to the Goddess’ dark womb to await renewal and rebirth. Old white-haired Mother Holle and Her underground realm are one interpretation of this aspect of the Goddess. In the fairy tale Mother Holle is described as being kind and generous and very just. She lives at the bottom of a well. The well itself can be interpreted as being the birth canal leading to Her dark underground womb...........Mother Holle is described as having ugly big teeth, a big nose and a flat foot. The latter shows her love for weaving or spinning, another sacred act associated with the Goddess: She is the Life Weaver, the Spinner of Destiny and Fate. In Central Europe Mother Holle also evolved over time. Instead of becoming the Goddess of the Underworld, though, She became the Queen of Elves and the Mistress of Witches. 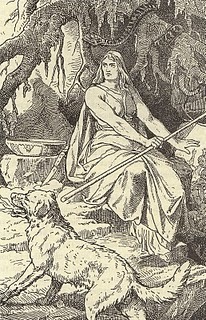 Her character was actually very similar to that of Greek Hekate, the old Crone who roams the world with Her fearsome dogs. 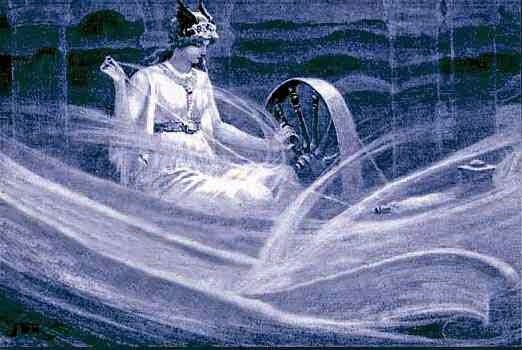 Around 900CE Frau Holle had become an old weather hag who was said to ride in on Her broom stick bringing with Her whirlwinds and snowfall. Her life-giving generous nature was retained more in Germany than in Scandinavia, as even during Christian times She was seen as bringing life to the land causing growth, abundance and good fortune."